St-Donat: Quebec: tourism, laurentians: Saint-Donat, lodging, hotels, inns, bed and breakfast, restaurants, snowmobile, mt-tremblant park, cross country skiing, alpine ski, hotel, inn. The site is online since 22 years. 400,000 visitors per year. Thank you! 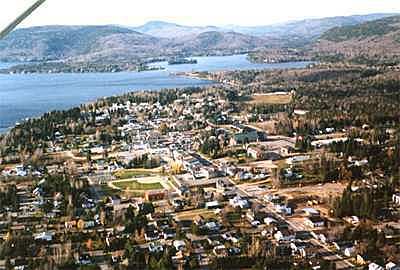 St-Donat, is a beautiful scenic village in the heart of the Laurentians. It is the only village in Quebec with two huge lakes side by side, Lake Archambault and Lake Ouareau. See our photo gallery for more details. You will find ski hills, cross country skiing trails, snowmobile trails, hiking trails, nautical sports, golf, to name just a few activities available in St-Donat. Take a look at our activities map. Mont-Tremblant Park offers you many activities in direct relation with nature. While hiking in the trails or fishing on its lakes, you will rediscover nature's peace and beauty. The village has all the facilities needed for a relaxing holiday in St-Donat. Grocery stores, depanneurs, videos, boutiques, hardware stores, brasseries, bistros, garages and various technical services, rentals, everything is in place to make your life easy. All around the lakes the owners of chalets add, by their own presence, to the quality of our environment. many of them take their retirement in St-Donat. Another proof of the exceptional quality of life in St-Donat. To ensure the quality of your sojourn in St-Donat, Hotels, Motels, Inns and Bed and Breakfasts offer lodging for your personal needs. Our restaurants fill the gap with menus that can accommodate every taste and every budget. Take a look at our restaurants map and our lodging map. For high-tech who like to work in a quality environment, St-Donat has much to offer. Quiet premises and a rhythm of life very close to nature. Since the arrival of Internet links in St-Donat, we have been able to open up to the world. Bell Canada has just finished modernizing its facilities and some links are connected with optical fiber.